Editor's Note: This review was originally posted on a personal blog kept on MySpace MANY years ago! At the time, I was trying to review all the Best Picture winner in a weekly series, and got pretty far before life got in the way and I started taking building a website more seriously. Not being one to throw away perfectly good content, the review was kept on a flash drive. In light of the recent announcement that the Ringling Brothers Circus would be closing, we decided it would be the right time to look at the movie. Rather than starting over from scratch though, we decided to clean up this review. It was a little rough around the edges and the writing style is very different, but I feel it still has some good points and is reasonably entertaining. A little old, yes, but I also find it interesting to see how my writing style has changed over the years. 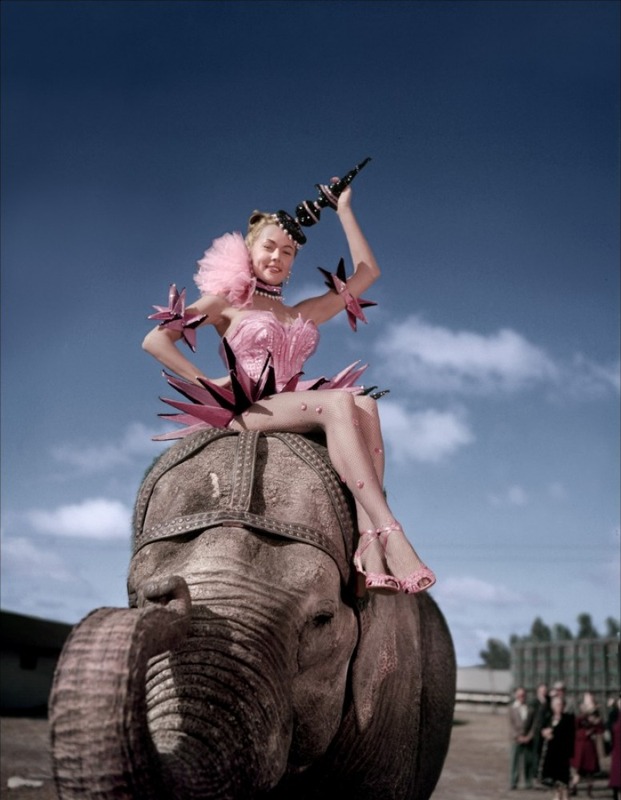 So enjoy the review (warts and all), and may the memory of the circus live on! 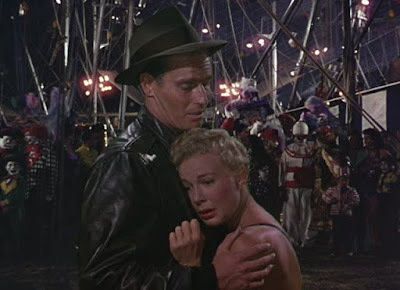 Our Oscar discussion now brings us to "The Greatest Show On Earth,"the movie that almost all movie historians believe to be the worst movie to ever win the Oscar for Best Picture. Indeed, while most of the recent movies we've been watching have been racking up the awards, it does make one worry when a movie suddenly wins only one other Academy Award other than the Best Picture (in this case it was Best Original Screenplay). But "The Greatest Show On Earth" can't be all that bad...can it? Even if it is one of the lesser Best Picture winners, don't all Best Picture winners have some entertainment value and artistic merit to them? You'd like to think so, and I'd like to say yes, but I'd be a filthy liar if I said this movie was worth the Best Picture award in any way. In fact, if it weren't for the fact it received such a prestigious award, I don't even think it would be on DVD today. Despite this movie essentially introducing the world to Charlton Heston and being directed by the master of 'epic' Cecil B. DeMille ("Cleopatra," "The Ten Commandments"), the movie is almost an outright bore, containing very little entertainment and being almost as long as "Braveheart" in terms of length. The movies storyline would be positively brilliant if it were a movie of the week special, but as a feature length film just seems silly. Brad Braden (Heston) is the ring leader for the Ringling Bros. and Barnum & Bailey Circus, a show so big and spectacular, for people of all ages, that it has been called the 'Greatest show on Earth.' 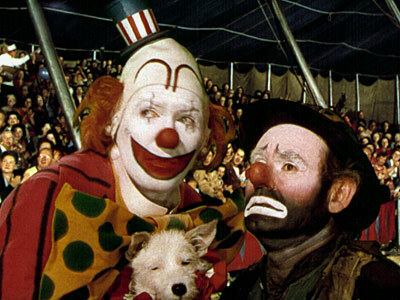 Sadly, the show has fallen on some tough times, and not as many people are going to the circus now (more then fifty years later, I doubt many kids even know what a circus is). 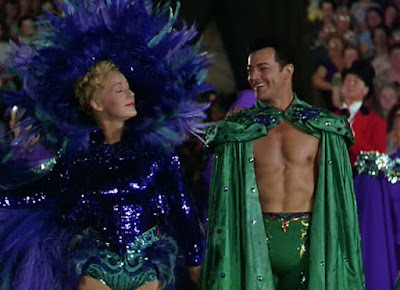 In an attempt to reel more people into the seats, Brad hires The Great Sebastian (Cornel Wilde), a pro on tight ropes, to be the new center ring attractive. The problem with this movie is that Brad has to take away the center ring from his girlfriend Holly (Betty Hutton), and she's not to happy about that. Well, she's not happy until she meets Sebastian and falls in love with him, which leads to a three way fight over the center ring as well as each others hearts. 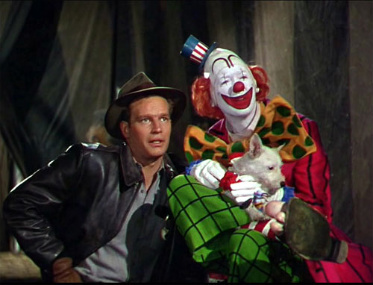 On the side of the three main characters is Jimmy Stewart as Buttons The Clown, a friendly clown who never takes off his makeup, gives sage advice, and may be on the run because of a dark past. 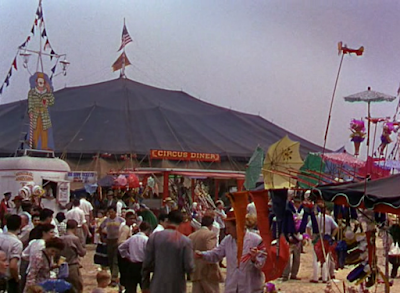 All of this takes backstage to the circus though, which is what the movie is really trying to sell. Sorry folks, but if you expect this movie to take the characters relationships and struggles seriously, then you've be dead wrong. With the except of Buttons, all the characters in these movies act like complete morons, and always make the wrong choices to help stall time. What really is at the front are impressive circus acts, where the animals perform some of the most amazing stunts and tricks captured on film. In-between the shows, the movie switches to a documentary mode where a narrator explains how the circus is run. Scenes of men tearing down tents and lifting them up take up more then a half hour alone, all while the narrator brags about how well oiled a machine the circus is. The movie then switches to some inner bickering with the three main characters, and then the acts begin. A single individual act can go on for more then fifteen minutes, just to prove how flashy this movie is supposed to be. Once in awhile the characters will actually get a chance to talk, and then they say nothing of importance. One twist in the middle of the movie involves Sebastian trying to impress Holly, but cutting the rope that holds up the safety net in an effort to do a death defying stunt that will impress her. Of course, this is the one time he actually screws the stunt up, and then breaks his hand, making Holly the center ring attraction once again. 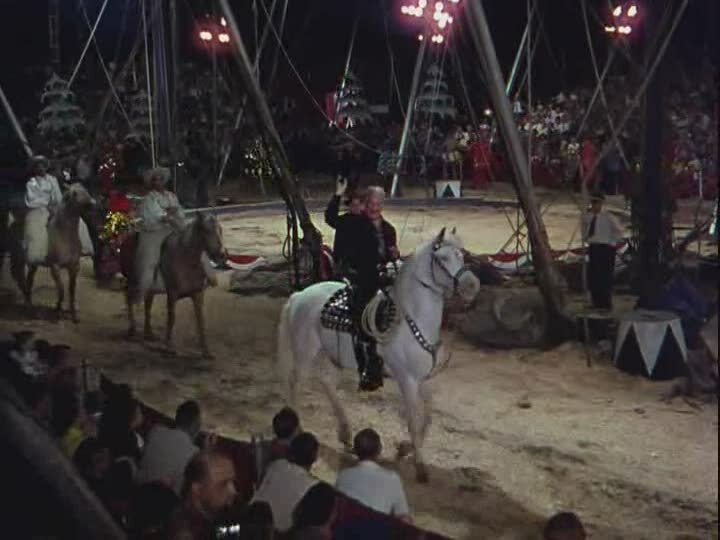 The most exciting sequence in the movie happens when a botched robbery causes the circus train to crash, thus releasing almost all the animals, but even this scene seems tame in by todays standards. Then you add in the fact that this movie is almost three hours long. Almost three hours long. Jeez Louise, it's a movie about the freaking CIRCUS!!! How long does this thing need to be anyway?! Doesn't the movie deprive the viewers just a little bit if they don't give audiences a reason to visit the circus themselves? Why go to the circus when you can literally see everything the circus has to offer here? Heck, why is less then an hour of this movie story development, while the rest is all stunts and documentary footage? Okay, to be honest the movie starts out fairly entertaining, and I thought I would enjoy it. But after you see circus act, after circus act, after circus act, you start to wonder why you're watching the movie instead of attending the actual circus itself (Editor's Note: Again, I'd like to remind readers that seeing the circus was an option when this review was originally written). The characters themselves are boring as hell, acting as nothing more then common stereotypes. Brad is the stern but king boss, Holly is the vixen, Buttons is the wise sage, and Sebastian is the ladies man. None of these people are characters, they are props to move the movie along so that we can get to more circus acts. Heck, my time eating a McDonald's cheeseburger has proven to have more meat than this movie does. The one thing I disagree with most people is that I do NOT think it's the worst movie to win Best Picture! Yes, as dull as this movie is, it's not the worst. It's somewhere between three and five, but there is a Best Picture winner that is far worse then this one is. That said, this is still a pretty bad movie, and it's not worth seeing more then once. And the only reason I say see this once is to see what the big fuss is all about. That said, Oscar lovers actually owe a lot to "The Greatest Show On Earth." For you see, if it weren't for "The Greatest Show On Earth" there may not be an Oscars in the form you'd know it to be. 1953 was the first year the Oscars were broadcast on television. Before that they were only heard on the radio, and most people could care less about them. But when this movie won Best Picture, the people who attended the awards were mad. Hopping mad. So mad, that you could feel their hate. And you know what? All the violent reactions the audience displayed were seen by the general public...LIVE! The reason to this movie winning so was visually hated, that the general public fell in love with the Oscars, and a new favorite pastime was invented. So while this will definitely be one of the most embarrassing moments of the M.P.A.A.S. in a way this movie winning helped make the Oscars a hit with TV viewers. That's got to count for something right? I suppose I should add to this review that in the ten or so years since I wrote this review, it has proven to be far more prophetic than originally anticipated, and now that the circus is officially a thing of the past, "The Greatest Show On Earth" may just gain some value again as a time capsule of a bygone era. Scenes where Brad are fighting with investors to get a full season worth of shows over concerns that people don't go to the circus are more haunting now than they likely were back then. Maybe, in a strange way, the movie will soon be seen as a more important film than originally thought. Still not a good one and still not entertaining, but, if nothing else, it may be fun to revisit from time to time, revisiting a form of entertainment that disappeared s a long time ago.